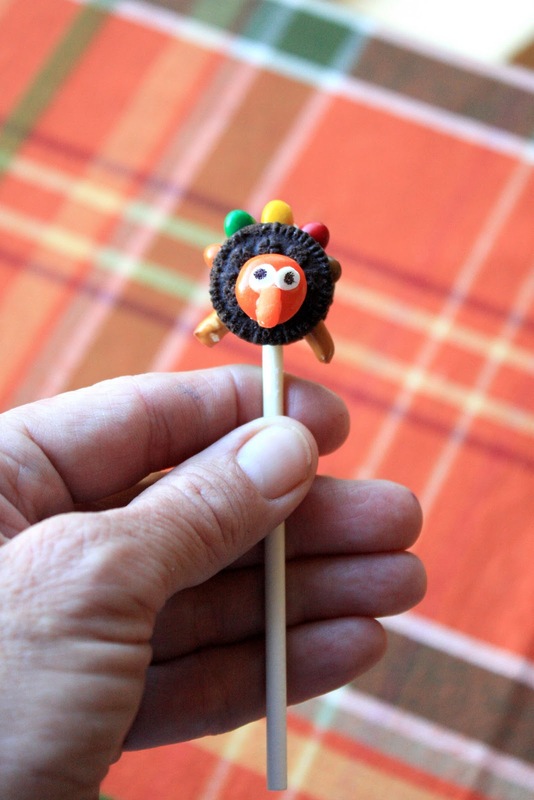 This turkey cookie business all started last year with the funny and creative Shelly (Cups and Cookies) and her adorable oreo turkey pops. After seeing them, I made a GIANT turkey cookie with my cookie cake pan. It was so fun! I think he's pretty cute, if I do say so myself. Due to his small size he can be eaten in one bite! How's that for built in portion control? Here's everything you'll need, well almost. I accidently left out the royal icing that I used to hold the two cookie wafers together, and everything else too:) A small sharp knife is also used. Take mini oreos and separate the wafers, being careful to leave the cream in the center undisturbed(I used a small paring knife to help with this). You will eventually put the two cookie wafers(with creme attached)together. Add some royal icing to a cookie wafer, around the edge on top of the creme, and add (firmly, but gently) different colored candy coated sunflower seeds (turkey feathers) across the top. Cut the tips of the pretzel sticks to about 1/2-inch and place firmly at the bottom of the open cookie for the legs. Add a small amount of royal icing to the top part of a lollipop stick and place it between the pretzels, to the middle of the creme cookie. Place a little dab of royal icing on the middle of the creme side of the second cookie and place on the prepared cookie half(with the seeds,pretzels). Put a dab of royal icing on the plain side of an m&m candy and place on the middle of the oreo cookie. Take two of the white confetti sprinkles and put a dot in the middle of each with the black edible marker(I use AmeriColor Gourmet Writers). Place two small dots of royal icing on the m&m and carefully place the confetti sprinkles on the royal icing dots, for the eyes. 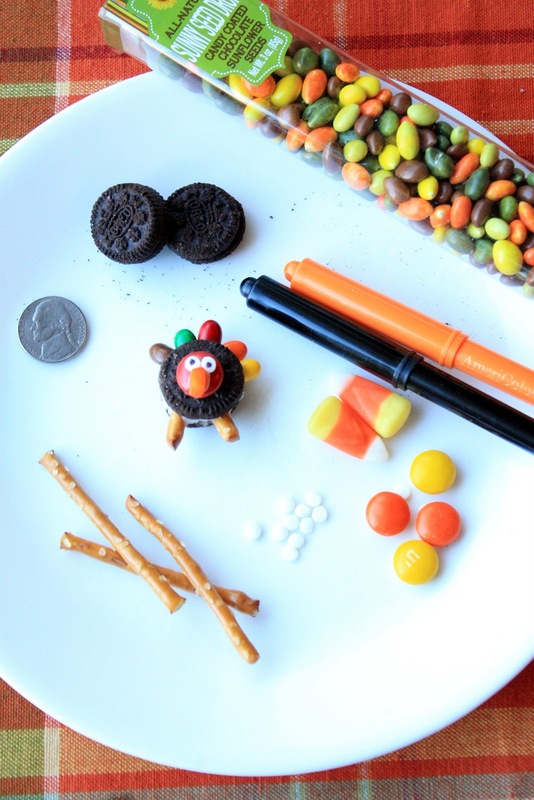 Use the orange edible marker to color the tip of the candy corn. Cut the tip off with a paring knife. Dab a small amount of royal icing on the cut side of the candy corn and place it vertically below the eyes, for the beak. Let the pops dry completely. That turkey pop holder is the cutest 50 cent garage sale find and your mini turkey pops are just adorable. The kids will get a big kick out of these for sure! Oh my goodness gracious. I love the teeny tiny turkey pops! And the stand is perfect for display! well I have to say these are the cutest mini turkey's evaaaaaaaaaaaah! Great display, what luck. I LOVE these! Absolutely adorable!! Visiting from At the Picket Fence. So adorable!! I love how they are mini's. These are too cute for words! Amazing idea. So cute. And sounds completely do-able too. Sue, I am always so amazed at your creativity with sweets!! Lovely. So cute! 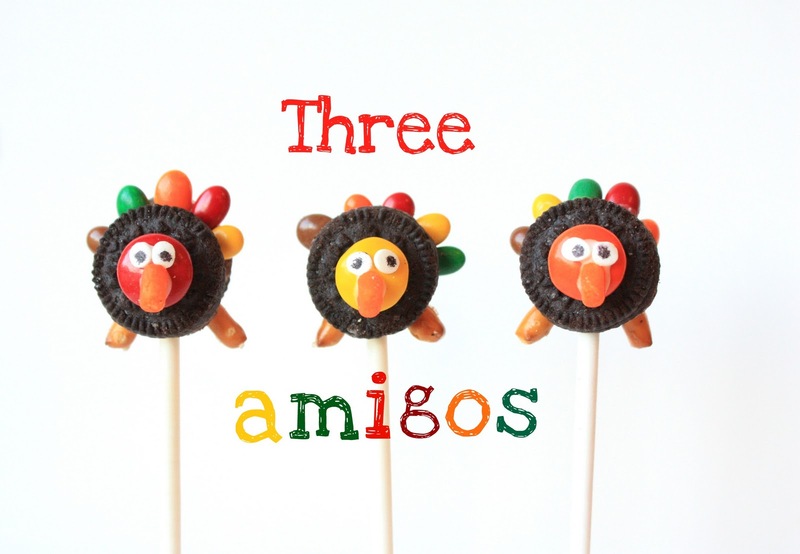 We won't be here Thanksgiving, but I love this idea! These are the cutest ever!!! I love that you used mini oreos and they are so colorful. I love it! These are so adorable. I love this idea and I love that you got the mama turkey for 50 cents. :D I've been wanting to go yard sale-ing for months! You are very creative. These are incredible and very cute. I love the mini version. I have never seen those candy coated seeds. They look really fun! I think I will just have to plan on featuring something you make every week because everything is so darn cute! Love these!! Holy smokes, Sue! Those are so small! And so darn adorable!!! You are amazing! 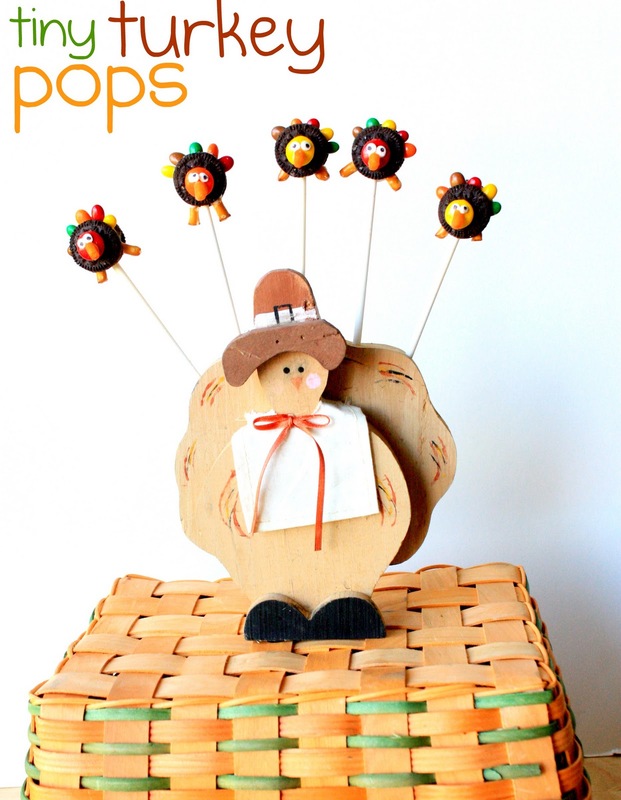 I heart your tiny turkey pops... they are too cute for words! These are too cute! My kids would love them! These are so cute. How wonderfully creative. I can't wait to make some of these for my kids. They are sure to be a hit. Those tiny turkeys are adorable! These are adorable, and I am looking forward to making them! I have never seen chocolate covered sunflower seeds. Can you tell me where to find them? Hope this helps, and have fun! Always creative with your treats...about those coconuts cookies yes that is 14 ounces..the standard bag sold at the grocery store. These are the cutest I have ever seen. 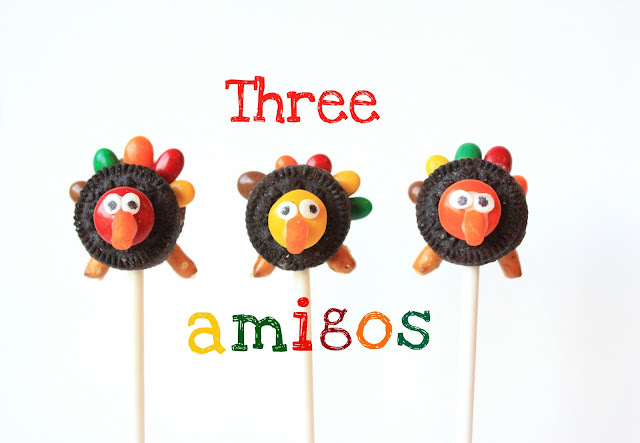 They are really adorable Sue...I'm in love with the 3 amigos! Aww, these are super cute! OMG!! Those are simply the cutest thing ever. I'm having a giveaway over at DIY Home Sweet Home. Would love you to stop by and check it out. Those are so adorable! I love the built-in portion control too! These are too cute! I can see my little munchkins going crazy over them. It is so fun to get a great reaction from the grandkids, because my kids are just too used to anything I do and the grandkids are the ones that oooh and ahh over everything. They would love these. Oh those are the cutest! Oh my gosh, I'm tickled pink just looking at these. These are so adorable, I agree with Cake Duchess your grandkids are so lucky to you.